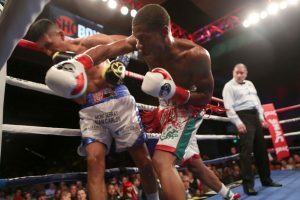 Under his own promotion Devin Haney Promotions the unbeaten Devin “The Dream” Haney took on Juan Carlos Burgos in the main event ShoBox: The New Generation. This card took place at the Pechanga Resort & Casino in Temecula, California. Banner Promotions and Thompson Boxing were also part of the promotion. In the Main Event No. 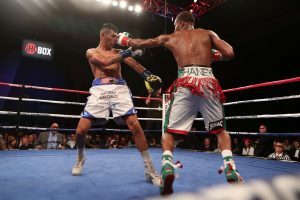 15 IBF ranked Devin “The Dream” Haney, 20-0 (13), of Las Vegas, NV, won a lopsided decision over Juan Carlos “Miniburgos” Burgos, 33-3-2 (21), of Tijuana, MEX, for the vacant IBF North American Lightweight Title, over 10 rounds. In the first round Haney moved using his jab while Burgos landed several left hooks. Burgos landed a long right to the head of Haney who was moving away at the time. In the second round Burgos kept throwing the left hook to the body while Haney mainly used his jab. Burgos ended the round with several left hooks to the body ending with a hook to the chin of Haney. In the third round Haney missed quite a bit before landing a pair of chopping rights to the head of Burgos. Burgos landed a left hook to the chin of Haney. Haney missed with a right but followed thru landing a left hook to the chin of Burgos. Haney ended the round with a right to the chin of Burgos. In the fourth round Burgos from southpaw landed a lead left to the chin of Haney. Haney landed a chopping right to the head while Burgos landed a left hook to the chin of Haney. Haney stalks while Burgos stays against the ropes moving side to side. In the fifth round Haney sticks and moves while Burgos lands solid left hooks to the body of Haney. Haney landed a lead right to the chin of Burgos who keeps chasing Haney. Haney hurt Burgos with a right uppercut to the chin. In the sixth round while against the ropes Haney landed half a dozen rights to the head of Burgos. Haney’s hand speed has made a major difference but the fans are starting to boo as Haney does too much running and countering when he stops moving. In the seventh round Haney decides to stand his ground for close to a minute at the start of the round before he started moving again landing the jab. Referee Zachary Young warns both boxers about talking to one another. There was little action in the round with the crowd booing again near the end. In the eighth round both started landing body shots while in the middle of the ring. Burgos warned for rabbit punch. Burgos landed three left hooks to the body of a moving Haney as the booing starts up again. In the ninth round Haney is going to work landing lead rights and chopping rights to the head of Burgos. With just under a minute left in the round Haney rocks Burgos with several rights to the head. Burgos did little fighting in the round. In the tenth and final round Haney landed a double left hook to the chin of Burgos. Haney landed a solid right after landing the jab to the chin of Burgos who just can’t handle the hand speed of Haney. Burgos landed a double left hook to the head and body of Haney. The booing started again in the final minute. Haney landed the final punch of the fight a lead right to the head of Burgos. Scores were 97-93 and 100-90 while this writer had it 98-92. In a rematch Super Lightweight Thomas “Gunna Man” Mattice, 13-0-1 (10), of Cleveland, OH, ended in a disputed split draw with Lightweight Armenian Zhora Hamazaryan, 9-1-1 (6), of L.A., CA, over 8 rounds. Mattice came in 3 pounds over the 135 contract weight. In the first round Mattice starts out moving around the ring with Hamazaryan chasing. At the halfway point of the round Hamazaryan landed a solid right uppercut to the chin of Mattice. Just under a minute Mattice landed his best punch of the round a right cross to the chin of Hamazaryan. Hamazaryan landed a right followed by a left both to the head of Mattice. In the second round Hamazaryan opened up with half a dozen unanswered punches. A left hook to the chin by Hamazaryan drove Mattice back several steps. Hamazaryan landed a left hook to the chin while Mattice came back with a chopping right to the head. In the third round after each landing well Mattice got on his bicycle. Mattice is using his jab keeping Hamazaryan at bay. Hamazaryan warned for hitting Mattice behind the head. Mattice landed a combination at the bell. In the fourth round after both mixed it up Hamazaryan rocked Mattice with a left hook to the chin forcing Mattice to continue to hold for most of the remaining round. Hamazaryan rocked Mattice with a left hook to the chin driving him into the ropes. In the fifth round Hamazaryan landed a 3-punch combination. Going into the final minute Hamazaryan was having his way with Mattice continuing to do more holding than punching. In the sixth round Hamazaryan landed a right uppercut to the chin of Mattice. Mattice warned for hitting on the break. Mattice landed a combination and then started moving around the ring again. Mattice landed a solid right just after the bell. The referee Ray Corona has done little to prevent Mattice from fouling. In the seventh round Mattice was warned for holding down the head of Hamazaryan. Mattice landed a hard left knocking out the mouthpiece of Hamazaryan. Hamazaryan continued chasing Mattice landing punches and getting held and pushed by Mattice. In the eighth and final round Mattice was moving and jabbing until a right from Hamazaryan to the chin rocked Mattice. Mattice started showboating as Hamazaryan is all business. Hamazaryan landed the last punch of the fight a right to the chin of Mattice. Scores were 77-75 Mattice, 77-75 Hamazaryan and 76-76. This writer had it 78-74 Hamazaryan. German Super Middleweight Cem “The Champ” Kilic, 12-0 (7), of Sherman Oaks, CA, defeated DeAndre “The Axe Man” Ware, 12-1-2 (8), of Toledo, OH, over 8 action packed rounds. In the first round there was no feeling out as both opened up. Originally set to be a middleweight bout Ware could not make it so they are in the super middle division. Kilic is much taller and landed several rights to the head of Ware. He landed four punches to the body. Both exchanged rights to the chin just prior to the bell. In the second round Kilic rocked Ware with a left hook to the chin while Ware came back with a solid right to the chin. Ware landed a hard right to the chin of Kilic. A Ware combination rocked Kilic just prior to the end of the round. In the third round Ware landed a 3-punch combination. Kilic drove Ware into a corner but Ware came back rocking Kilic with a right hand to the chin. Ware worked his right well against the taller Kilic who used a good right uppercut. In the fourth round both came out throwing leather. Kilic showed blood from his nose. Kilic knocked out the mouthpiece of Ware with a right to the chin. Kilic landed half a dozen unanswered punches to the head and body. In the fifth round Kilic started using his jab more setting up Ware with right hands. Ware landed three body shots at the halfway point of the round. Kilic landed a flurry of punches to the head and body of Ware. Both continue to throw a good amount of punches. In the sixth round Ware kept coming forward but walking into solid punches by Kilic. Ware landed his lead right to the chin of Kilic which has been his best weapon so far. Once again a Kilic right knocked out the mouthpiece of Ware. In the seventh round Kilic landed half a dozen unanswered punches while Ware came back pushing Kilic with his head and gloves. Ware got a warning from Referee Tony Crebs for using his head. Both landed punches by bunches up to the end of the round. In the eighth and final round Ware came out throwing possibly he may be behind. It may have been the first clinch in the fight at the halfway point of the round. Ware has Kilic moving backwards. Kilic has never gone beyond four rounds. It was a very good fight. Scores were 78-74, and 79-73 while this writer had it 77-75. Unbeaten Lightweight Devin “The Dream” Haney and 3-time world title challenger Juan Carlos Burgos will battle for the vacant IBF North American Lightweight Title Friday at the Pechanga Resort & Casino, in Temecula, CA. This will be on ShoBox: The Next Generation triple header with Davin Haney Promotions. “I’ve been saying for a while now that I always felt like I was my own promoter. And I feel like a lot of other fighters feel they are their own promoter as well because they do all the marketing, they do their social media, and they are getting their name out there. I’m just one of those fighters that took the initiative to actually go get my promoters license and go all the way with this,” said Haney. He is also starting his own stable of fighters including Darren Cunningham, 6-0, who will be on the card. The 19 year-old Haney, 19-0 (13) is promoted by Top Rank and won the vacant USBA Lightweight title in his last fight in Philadelphia defeating Mason Menard, 33-2 who retired at the end of the ninth round. This is scheduled for 10 rounds. Vargas has challenged for world titles at Featherweight and Super Featherweight and is stepping up to lightweight. “He’s fought in Tijuana a bunch of times (10) so I’ve seen him in person. I didn’t really pay attention to him at that time. He has ability. He’s hungry with good skills but I don’t think he’s ready for a fighter like me. He’s too young and I’m an experienced fighter that knows how to win,” said Burgos. The co-feature is a re-match in July between Thomas “Gunna Man” Mattice, 13-0 (10), of Cleveland, OH, and Armenian Zhora Hamazaryan, 9-1 (6), out of L.A. with Mattice winning a controversial 8 round split decision with Mattice hitting the deck in the second round. This was why just three months later they are in a rematch. Mattice is promoted by Banner Promotions and Hamazaryan by Thompson Boxing. This is scheduled for 8 rounds. For Hamazaryan it will be his third straight fight in the US with his previous fights being in Russia. Rounding out the triple header another 8 rounder between Super Middleweight German born Cem “Champ” Kilic, 11-0 (7), out of Sherman Oaks, CA, and DeAndre Ware, 12-0-2 (8), of Toledo, OH. Just last month Kilic stopped Joe Amouta, 7-1-1, in 3 rounds. All but one of his fights (Mexico) has been in the US. In June in his last fight he defeated Puerto Rico’s Enrique “Kikin” Collazo, 11-0-1 (9), in a majority decision over 8 rounds.